John Clark Motor Group, one of Scotland’s largest dealer groups, has agreed to a brand-new partnership with lead management specialist RAPID RTC. 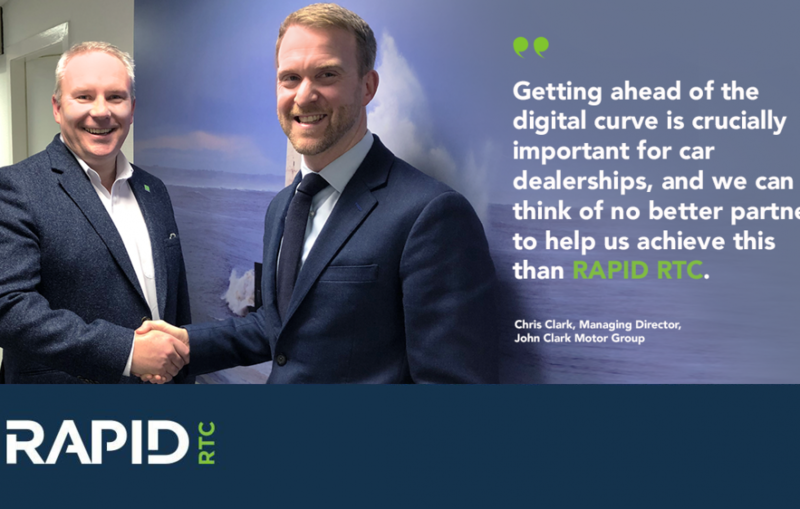 The relationship will see RAPID RTC provide its innovative platform to John Clark’s network of more than 34 retailers, covering major car marques, including BMW, Jaguar Land Rover and Volkswagen. The platform is expected to be rolled out across the Group by the end of January 2019, with RAPID RTC providing bespoke training for dealership staff. John Clark’s investment in the Lead Response solution comes at an important time, with an ongoing push across the wider automotive industry to improve response times. According to recent research, more than 50% of all consumers’ online enquiries receive a no response or a poor response from automotive retailers. In stark contrast, RAPID RTC’s platform, which seeks to improve a customer’s web-based retail experience, guarantees a 100% response rate for online enquiries in under 30 minutes.